Please forgive the rage that is about to ensue. This post is purely a “get it out of your head quickly” post. This year I discovered wheelchair racing as a means to defy my enormous decline in physical health. I’ve blogged about this before & how it is the first sport that has not caused me excruciating pain. About how I finally felt able to participate in something physical. About how the inclusive nature of my team mates boosted my mental health immensely. I have my 1st post-holiday training session tomorrow evening & right now, for the first time ever I don’t want to go. Why? Fast forward to tonight where I happened to stumble upon a twitter conversation about disabled sport classification by the IPC (in oder to take part in “real” races, you must be classified). They have released a statement specifically excluding Ehlers Danlos Syndrome as a qualifying disability for disabled sport. What this means for me is being treated as an able bodied athlete (you can stop laughing now…. seriously, stop it.) and as such can only participate in open races with no chance of joining my friends on the track for races against people similarly matched to my own actual ability. Ok, I was never destined for anything other than local competitions & having fun, but I have rarely wished my genetics on anyone, however I’ll make an exception here. Especially after this news story. I am more than a little bit gutted. Any visions of progression in my one physical outlet (no matter how far fetched they may be) have been dashed because someone decided that one type of disability was “better” than another. How dare they exclude genuinely disabled athletes because they don’t fit into a neat little tick box?! You are a professional body and as such have an obligation (if not legally, then morally) to pick up a goddamn book and read about conditions that cause a spectrum of disability. If you ever wondered why Ehlers Danlos Syndrome is considered an Invisible Illness, here is you prime example at the very highest level. What does your not disabled look like? It looks like someone who fights with their racing chair & dislocates joints and keeps going. It looks like chronic pain that eats away at you & makes you question at 2am exactly why you keep going. It looks like more medication than I can count on two hands. It looks like my husband having to cook for me, and help me wash & dress myself. It looks like strapping myself with physio tape to keep joints in place. And when that doesn’t work, biting my cheek to stop myself crying from pain in front of the kids I train with. It looks like being lifted from my racing chair into my day chair due to no sensation in my lower legs because my spine is slowly curving & compressing my nerves. Now tell me how perfectly able I am. F*** you IPC and the bureaucratic horse you rode in on. Channel 4 has just released its advert for the 2016 Paralympic coverage with an emotive advert. Following this, I read a blog post from the Crippled Scholar that made me react in a way I wasn’t expecting. She raised some very legitimate concerns about the advert & yet I felt instantly defensive. Why? I’m the least sporty person on the planet… or am I? Perhaps it’s because I know one of the athletes in the advert, or because more recently sport has impacted on the way I view my own disability. So rather than try to tweet a response, I thought I’d lay out a stream of consciousness here. One criticism is the use of the term superhumans. In the context of it being disabled people achieving everyday activities and met with applause, then yes, take your ableism and insert it into yourself in whichever orifice you choose. But when it comes to athletes, some of these people are just shy of X-men. 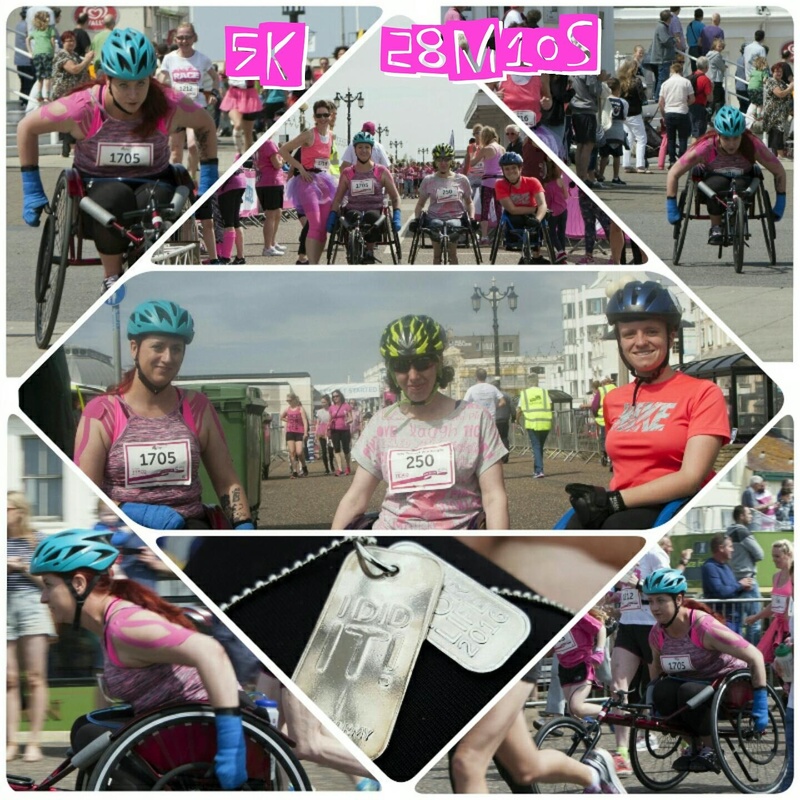 At our local Race for Life 5k, Lizzie beat every single runner by finishing 1st place in 17 minutes by propelling herself in a racing wheelchair. It doesn’t take anything away from her to acknowledge her disability & say that she’s bloody awesome. On the flip side, there is the potential for making a big fuss of disability sports to create that god awful motivation crap with the “the only disability is a bad attitude” slogan. (I’m still smiling at those stairs Stella). The author of that poster ought to read what the definition of disability is. I think the major tell here is to look at how other adverts describe the able bodied athletes. In the P&G advert, they are portrayed as oddly traumatised & moulded by their mothers – this does show how hard they work, but rather suggests that Dads aren’t as important and that you need some sort of adversity in order to be a winner. The BBC advert is just a bit weird with a sloth doing gymnastics & an anteater on the shot put. No suggestion of being superhuman, but there’s that whole rippling muscles theme. I think from all of these, the only message is that advertisers are playing to an agenda and won’t please everyone. Based on the adverts I’ve found, despite initial grumbling, I’ve found myself agreeing with the Scholar & the raised eyebrow at the Superhuman term is probably valid as it hasn’t been used equally for the able bodied athletes who also deserve the same recognition for being a little bit amazing. To individuals- don’t feel that because you have a disability, it’s game over (especially when those who believe they know best tell you to give up). I spent my entire life avoiding physical anything because of chronic pain and continual injury. Earlier this year I tried going to a local gym & cried with frustration having been wheeled past the bins to meet an instructor that couldn’t comprehend not using a treadmill despite being in a wheelchair… It would’ve been easy (and perfectly acceptable) to give in, but our school is all about Grit & Zest & Growth Mindset & other ones… whatever – I’m a stubborn old bat who won’t give up (Also known as gritty). Later, when I announced that I was going to try wheelchair basketball, family & friends were horrified. It turned out that no, that wasn’t the sport for me – the risk (and reality) of dislocation was too much. But then I discovered wheelchair racing & everything changed. After 36 years, I found my sport. I still dislocate most sessions, but rarely a major joint, and I’m building strength & stamina in my upper body that has a knock on effect on my dysautonomia. Mentally, I’m in a much better place because I’m told twice a week that I’m a racer & doing great. 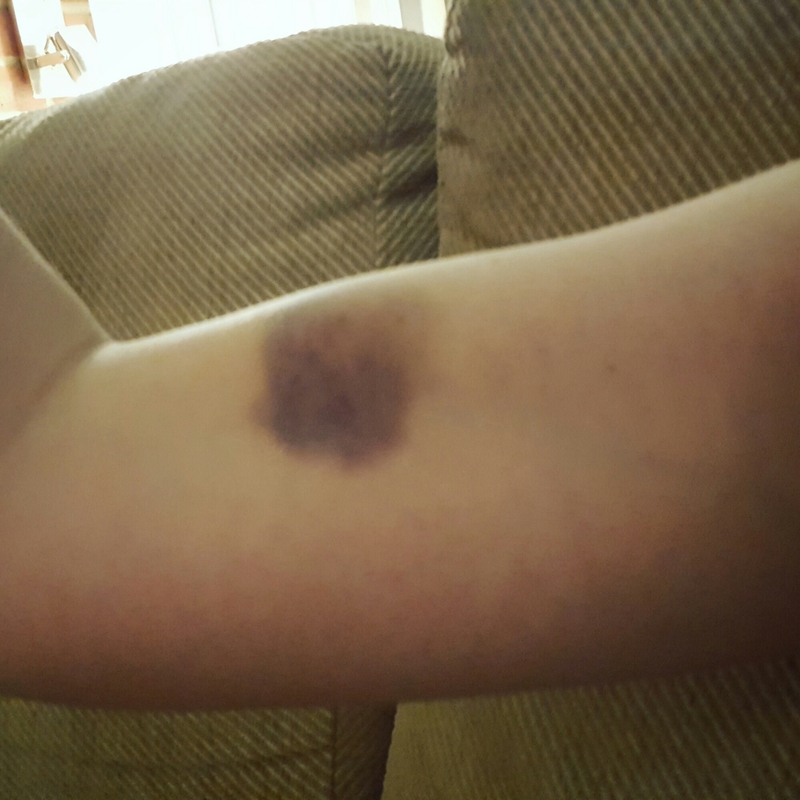 The reality is that I’m still dragging myself around and finishing so exhausted that I want to vomit & my arms are constantly sporting the bruises that come from pushing smaller rims (racers badges of honour). I may look like a wheezy flintstones car, but in my head I feel like a superhero. To parents / partners /friends: the loss of mobility doesn’t prohibit your loved one from trying something new. Please don’t hold them back in case people stare or laugh. Yes, the gym bunnies look at me like I’m an alien when I rock up in the (new) gym in my wheelchair & use the handcycle, but when I arrive to chair racing with my fellow wobblies, I have never known a more supportive atmosphere. Our coach is a volunteer and does it because he’s passionate. The guy deserves a medal (and beer) himself for keeping us in line. One of the upsides of camaraderie is improved mental health – the downside for our poor coach is that we giggle & hare about the track like naughty schoolkids. Finally, and probably most importantly, the “Yes I Can” message from the advert sends a very clear message to local Athletics clubs that sport is sport able or disabled. 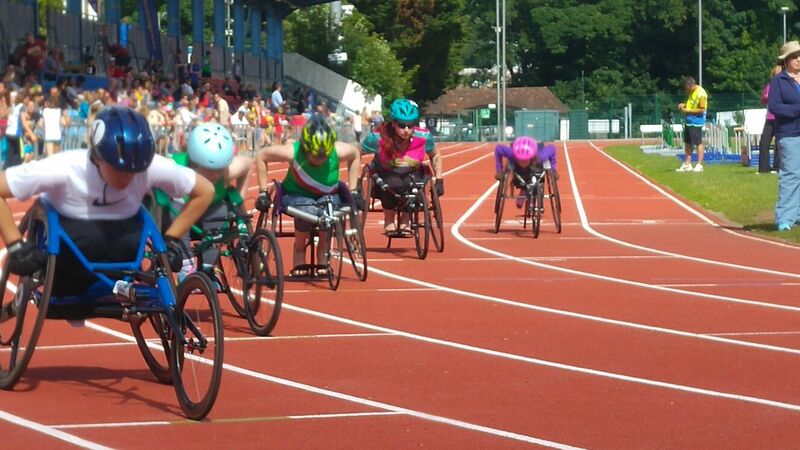 Worthing Harriers is an athletics club, we just happen to be the wheelchair division. The club owns a set of chairs for us to use & as we get into the sport, then we can choose to buy our own chairs (and even then, the contacts through the club help with finding 2nd hand chairs or fundraising for custom built kit). The whole thing started with one child contacting the club and asking why he couldn’t train with them. 3 years on & we’re growing in numbers. Many people working in sports fields need to hear the Yes I Can message. There is still a huge stereotype within society that disability means you just stop & if you don’t, then you must be faking it. So the more disability sports is shown on TV, the more normalised it becomes. If it’s normalised, then sports clubs will begin to assume that accessible clubs are just the norm and include them as standard… prices come down… they’re no longer superhumans because it’s normalised. Job done. I made it sound so easy! So yes, I agree that the advert isn’t quite how I’d want to be portrayed, but it is playing on the vibe left after invictus to make able bodied people sit up and take notice that people with disabilities are actually out there doing more than spending their taxes (oh yes, I’ve heard that line). We’re working, we’re having families, we’re learning, we’re pushing ourselves to our mental & physical limits. Just. Like. You.